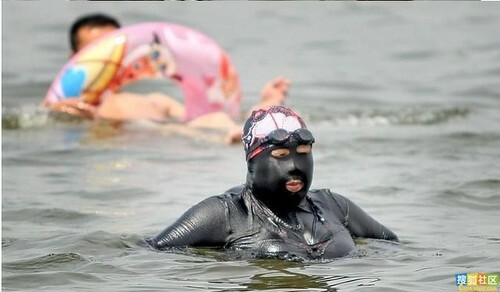 A fat Chinese lady from Qingdao, a city in eastern China, has became famous on wearing this ‘high-tech’ anti-tanning swimwear. The black latex swimsuit has covered her whole body including her head, only her eyes, mouth and both hands can be seen. The purpose of this custom-made swimsuit is to prevent skin exposure to the sun (prevent tanning), and perhaps protection against jellyfish when swimming. You can see more info here about latex clothing. Meanwhile, the photo of the fat Chinese lady wearing latex swimsuit was spreading like crazy on Chinese Internet, and lots of comments from the Chinese internet user. Most of them think she has covered by BP oil and have better wearing then Ladygaga.